Hi, my name is George Christakis, and I own the famous Chez Lui Restaurant in New York City. I also star in my own celebrity cooking show on cable TV. So how would a guy from New York who loves gourmet food meet up with the feisty redheaded culinary reporter from Ranchero, Texas? Did I mention said redhead lives on fast food and wouldn’t know a canapé from a can of peas? Well, when my friend signed on to sponsor the Caribbean Cook-Off on the fabulous Carnation Queen cruise ship with the local radio station, she asked me to be a judge. Because no one suspects Jordan of being so clueless in the kitchen, she was also asked to judge. Oh boy! Here's where it gets good. You should have seen her face when she had to taste some of the delicacies! But she was a real trooper, especially when pretty boy Stefano fell face first into his signature halibut dish on opening night. I have to say that even though Jordan may never be a Top Chef contender, she sure knows what to do when something looks "fishy." Sorry. That’s all I’m allowed to tell. You'll have to pick up a copy of MURDER FOR THE HALIBUT, releasing January 1, to find out what happened. Since we're having such a cozy Christmas here at Killer Characters, please leave a comment to win an autographed copy of MURDER FOR THE HALIBUT. If you have a problem leaving a comment, you may send it to me at Liz@Liz Lipperman.com. If you've been on a cruise, what was your favorite part? The food? The entertainment? The sights? If you haven't, think about it and guess which part interests you more. My favorite part of being on a cruise is visiting different places. I got to explore the Bahamas on my last cruise and it's so exciting to see how different people live in different countries. Kimberlee, I love the Bahamas. Most of the cheaper cruises out of Galveston cruise the Caribbean. Thanks for sharing and good luck. I have not been on a cruise but I know you'd never get me away from the food and then just the plain joy of riding on deck, in a comfy chair with a good book! Good luck on your new book, sounds great! This summer a friend and I took a cruise to Alaska. The food, the entertainment, the ship, the sights - all were terrific! But the best thing we did was take a helicopter ride, land on a glacier and walk on it! Now I'm really jealous. I also did the Alaskan cruise but only got to see the glacier from the ship. I can't even imagine how excited you must have been. I have not had the opportunity to take a cruise, but my husband and I are registered to take an Alaskan Cruise, Sept, 2013. I'm looking forward to this trip because I've heard so many good things about cruises. And we haven't had a real vacation in a few years. Our two daughters have talked about cruises, the food, the shopping, the sightseeing. Sounds wonderful! Diane, read the last comment. She got to walk on a glacier! There is a long train ride (can't remember which city) that was really exciting, also. Let us know how you loved your virgin cruise. I've never been on a cruise, but I sure would want to. Not for the food or the entertainment, but for the sights. To visit all those exotic countries and cities, and see it all myself. As I mentioned, the food is great, but the sights and sounds and new experiences are priceless. You can get a 7 day cruise out of Galveston for under $400 in January and February. The best part for me on the ship was the food, mainly because I didn't have to cook it. The sidetrips were great too. And Kaye, there was always food available at all hours. I loved the ice cream bar and the pizza one. I've never been on a cruise, but in addition to being a bookworm, I'm also a shutterbug - just think of all the wonderful pictures! I never remember to take pictures, so I would love going on a cruise with you, Booklady. On the last cruise I took, though, I did take a lot of pictures as I was documenting my research. I haven't taken a cruise yet, but I would most love seeing new places and lots of good food! Ikleback, I hope you get the opportunity to take one. They're awesome. I haven't been on a cruise, either! But I bet it would be fun. I'd have to go on a major diet, like, starting now so that I'd be ready for all the good food in a year or so. I heard you about the diet afterwards. Like Jordan, I spend a lot of time around the chili dog grill. And room service if free on cruises, so you can order food up to your cabin anytime. I know the food would be great but hopefully the scenery would be breathtaking. DJ, you're right. As great as the food is, nothing beats the scenery, especially when the boat is leaving the port and you see the city in a panoramic view. Usually, the ship docks while you're sleeping, so you only get it when you leave. I have never been on a cruise, but I think that I would enjoy the food, the entertainment, and the views of the ocean. I hope you get the opportunity to go sometime. As I mentioned, in January and February, the cruises are really cheap. Check it out from a port near you. I haven't been on a cruise, but if there were views other than the water I would enjoy that. I understand the food is wonderful but I think I would prefer the entertainment. There is nightly entertainment plus activities going all all day long on the days you are at sea. When the ship docks, there are many excursions available or you can just see the islands on your own. I always loved the shopping, and I actually have the purse that Jordan buys in St. Marten. I've never been on a cruise either but I'd love to! Here's hoping you get a chance to go, Acemommy. They're awesome. Hi Liz. I have been on a number of cruises and enjoy visiting new places. Cruising into the harbor at Malta is one of the most incredible sights I have ever seen -- just breathtaking. Ooh, I've never been to Malta, Mary Louise. I'll definitely put that one on my dream list. Even though I have never been on a cruise, everyone I know who has been loves the food. As I've mentioned, the food is awesome and plentiful. But if you're like me, invest in the patches that go behind your ear to keep it all down. Sandy, that is awesome. There is so much to see in this world. I have never been on a cruise but I think I would love the food and entertainment if I was to go. You definitely would love them, Ingeborg. Hope you get to cruise one day. You know, I've never been on a cruise, but I would probably love the food and entertainment :) Of everything I've heard about them, food seems to be the overall agreed upon favorite! Again, I can only say the food is awesome. I'm a big junk food eater (liker my heroine Jordan) and I love the grills where I can get burgers, dogs, fries, and pizza all day long. Then at night I venture out to the swanky dining rooms and I even try new stuff. I figure if I hate it they'll being me something else, or I can have two desserts--or three!! Ah, Elaine, you make me want to book one of those January cheapo cruises. Fingers crossed you get to go someday, Mandie, but in the meantime, MURDER FOR THE HALIBUT is a nice way to get a little piece of it. Sorry, that was a shameless plug!! I love, love, love cruises and wish I could do another righ now. My favorite part is seeing the sights. Then just finding my cozy spot and reading or doing needlepoint. Love to you, Liz! Vicki, I love the down town, too, although I also love the trivia competitions, the karaoke, etc. My absolute dream is to find someone lounging by the pool reading one of my books! I haven't been on a cruise but my husband and I daydream about all the food! Of course, the scenery wouldn't hurt either. Love this cozy series! Ah, Jilzee, what a sweet thing to say. Here's' hoping you and hubby get to go on a really romantic cruise someday. I've never been on a cruise, I'm worried I'd get seasick! A friend of mine worked on a cruise ship as an entertainer for 2 years though-so I have pictures, postcards, and a few presents from his travels! I'd love visiting all the ports and exotic locals, but I'd rather stay home! Tried one cruise. Picked the wrong line. It didn't really suit us. But the destination (Bermuda) was lovely. Libby, don't give up. Try another one. I have a friend like you, though. She hated it and will never set foot on another cruise ship again. I've never been on a cruise but the best thing would to be there with a loved one. And the food, the sights, people-watching, and did I mention the food! Karen, how sweet to list being there with a loved one as the best thing. We are planning a cruise right now for the summer of 2014 when all of us (kids, grandkids, and other family members) are going on a cruise to celebrate our anniversary. I am paying a little every month for it. Can't wait to see my adorable grandkids having so much fun. I imagine what I would like about a cruise is everything being so conveniently located! That's really true, Kim. I can't sing the praises enough about cruises. We always get the cheap cabins because we spend so little time in them. I went on one cruise to Mexico, almost 20 years ago. While I loved the buffets, the water was very rough so my appetite wasn't always as strong as usual. The most memorable part was a close encounter with a kind of Mexican raccoon at a marketplace! Janel, sorry the water was so rough. A queasy stomach is a bummer. I'd love to hear more about the raccoon. I've never done a cruise, but if I ever do, it would have to be one where I could watch the whales!! Tom, I've never seen whales on a cruise, but I have seen dolphins swimming along the side of the ship. We did, however, go on a whale watching tour in Seattle once and saw many many whales who seemed to love all the attention they were getting. I'm publishing this for a reader who couldnl't get blogger to work. Drats! I had trouble leaving a comment - I'm not sure why. Nevertheless, below is my comment to the question you posted on your blog and my entry to try and win the autographed book! I love waking up while on a cruise and finding a different landscape or exotic port outside my porthole. It's like Christmas morning!! That is another amazing part, Amy. And thanks for not giving up and emailing me with your reply. Good luck with the book. I will let random.org pick a winner, and then Ill post it tomorrow. And another failed attempt at Blogger from Judy Ferguson. Consider yourself entered, Judy, and good luck. Never been on a cruise but would love to go. Here's hoping you get a chance, Candace, but until then, enjoy the Western Caribbean with Jordan and her gang of wacky friends in MURDER FOR THE HALIBUT. And with a bit of luck, read it for free!! I have never been on one :( but I hope to go someday. I heard the food is amazing! Lily, you really need to go. Do what I'm doing and pay a little of the cruise each month. And yes, as I've mentioned nineteen times already--the food is AWESOME!! Never been on a cruise. To much water. Kiki, I realize that cruises aren't for everybody. Hopefully, you'll win the free book and can experience the wonders in the comfort of your own home!! I haven't been on a cruise but my favorite part would likely be the options and opportunities to feast on great food. Lil, the food seems to be the overwhelming favorite of all the commenters. I can only say AMEN! Fresh fish at every meal. I wish I liked fish, Jake, but like my heroine, I can only eat it beer battered and fried. I envy you since it is so healthy. but please redeemer--don't eat the HALIBUT!!!!! I went on a cruise to Antarctica (from New Zealand - took forever to fly there). I won't say that the best thing was when I got to sit at the only dinner table with the ship's contingent of men without partners because my husband was seasick was my favorite - but... Nor will I say that the morning we had to stay in our rooms and eat from the mini-fridge for breakfast because of hurricane-force winds was a shining moment. But walking among penguins, visiting explorer's huts left behind in the early 1900s, and having snacks at the American Antarctica base was pretty neat. Norma, that sounds fantastic. I've never been to this area, but you've made me want to go. And I love that you got to be Princess at a table full of men. Bet your hubby got better in a hurry. Thanks for sharing this wonderful story. I have never been fortunate enough to be on a cruise, but I know I would love to see the new sights and experience new things. Here's hoping you get to go soon, Annette. Everyone should go on at least one cruise in their lifetime and get treated like royalty. Just standing at the railing and smelling the fresh sea air. Watching the people enjoying themselves. Oh..and the FOOD!!! Mary Alice, I can almost smell it myself. It is such a great way to relax since you are almost totally away from computers and cellphones. I say almost because you can get access to both of these, but it's costly. I have been on a couple of cruises and i like the evening entertainment the best. Then the lazy daytime activities that you can or can not chose to participate in. Everything you mentioned would be on my list, too, Joye. I loved the lazy days sitting around the pool with a good book!! Love cruises ... favorite part is just unpacking once and getting to go to all those different places without lugging suitcases around. The food's not bad either! LOL. Another great reason for going on a cruise. I hadn't even thought about that one. And maybe you'll be lucky enough to win a free copy, Tina. it is Christmas, you know, and I'm guessing you've been a good girl all year. If any of you are friends of mine on Facebook, I just posted a short teaser for this book. If you aren't my friend, why not?? I'm a nice girl, too. I've never been on a cruise, but.....if I ever go on one, I'd like to go on an Alaskan cruise. Hey, Kaye, the Alaskan cruise was terrific. We got a really good price and went with friends. It was about $75 a day. I hope you get to go.The glaciers were awesome. But even in June, it was cold. This Texas girl had to go out and buy a coat. Never been on a cruise; I don't travel anymore. A European cruise would be great or to the Caribbean. They probably have them to Hawaii, too. I'd probably love the food but I have no idea about what kind of entertainment they have. I did see a show once at Busch Gardens in Williamsburg and I think the characters were supposed to be on a cruise ship. I'll have to become a Facebook friend of Liz. Thanks for inviting everyone. I'm scaring myself because I've been on a European cruise, too. Geez! Do I live on these cruise ships? Actually, my brother-in-law is Italian, and he wanted to see where his grandparents were born, so he and my sister invited us to tag along. We started off in Barcelona and sailed to Nice, Venice, Rome, Palermo and a few others. Although it was extraordinary, I needed a vacation when we got home as we were constantly busy with tours in every city. Like I said, we always get the cheapest cabins since all we do there is sleep. And I'd love it if you friended me on FaceBook. Went on a small ship (68 passengers on a ship that held 98) cruise up Alaska's Inside Passage from Seattle to Juneau. The best part - all of it. Food was memorable. Wildlife amazing. And the relaxed pace set by the Cruise West crew. Wish they were still in business. Henry, this is good to know. I've only been on the huge capacity ships and have often wondered if the smaller ones compared. We also went from Seattle to Juneau. Love the Alaskans!! I've never been on a cruise - actually, I've never been on a boat much bigger than a canoe. But if I was to take a cruise, I'd want to take one that lets me do some whale watching. I love whales! Debbie, try the boat tour that I talked about earlier out of Seattle. We saw tons of beautiful whales, all performing by the boat for us. They were fantastic. They are beautiful creatures. our family recently went on a disney cruise to the carribean. we took our three kids, my parents, and my grandmother, who is 80. she said it was the best vacation of her life! it was pretty easy getting used to relaxing, someone else cleaning your room and having delicious dinners every night. (one negative-i gained at least five pounds that week-lol) the pools, ocean, kids activities, and aquaduck slide were awesome, too...i can't pick any one thing! i highly recommend the disney cruise. every single staff member you even pass by treats you like a 'princess' (or prince). lots of things for adults and kids to do all day long. they even have a 'club' where you can leave your kids to be supervised and do fun stuff w/the counselors while you go and do whatever you want. love, love, loved it! Kami, I have heard so many good things about the Disney cruises. The one we're looking at is a 7 day cruise out of Florida on Royal Caribbean that is geared for kids with clubs and lots of cartoon characters running around. I looked at the Disney cruise and thought I would get more bang for my buck with the 7 day cruise. Disney is twice the price, but I am envious and still may change my mind. Thanks for sharing your adventure. Never been, but the food sounds good. Hope you get to go, bn. And thanks for commenting. I just know I would be sea sick on a cruise, so I'll stick to dry land thank you. I get sick easily, too, Mary, but I always get those patches I talked about. They are transdermal(through the skin) scopalomine and they completely take away my seasickness. If you ever get an opportunity to go on a cruise, be sure and get this prescription. I don't do much drinking or gambling, either, Lexie, but I have never felt bored. I also love the reading time. As I mentioned earlier, cruises are not for every one. 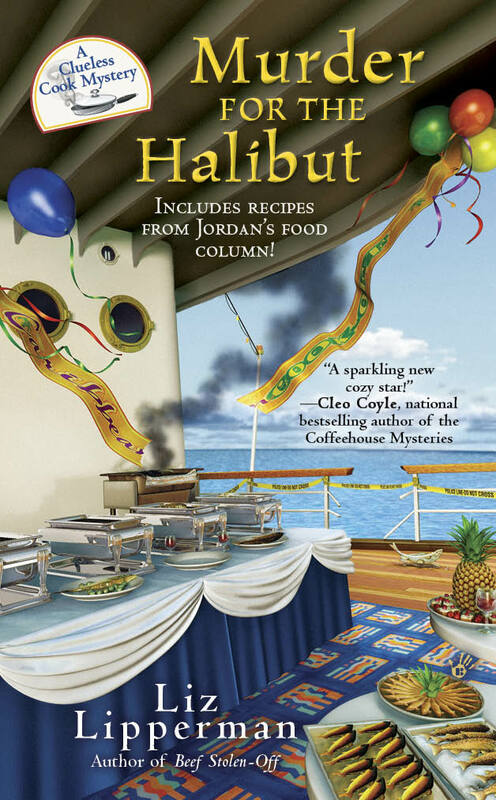 Hope you can get a cruise fix from reading Murder for the Halibut!! I would love to go on a cruise. I've never been but I think it would be so relaxing! Ha, Crystal. I usually come home needing a rest as I love to get all involved in everything. It is fun to sit by the pool or by the rail and read. my favorite part of a cruise was the journey to Bermuda from NYC!! it was my one & only cruise, so far!! Cyn, glad you enjoyed that cruise. The days at sea are usually filled with many activities. And you're welcome. I love hoking new readers with giveaways!! I've never been on a cruise--but I think just getting away from home and relaxing would be the best part. Ah, relaxing. Love it. Thanks for commenting, Sue. Ah, Stacie, you silver-tongued devil, you. An as I mentioned earlier. Everyone needs to check out the cruises in January and February as they are really cheap. It doesn't matter if it's cold where you are because you can go to a warm place. For anyone else, I will mail you an autographed bookmark if you send your address. It has been so much fun with my blog this month, and I have you wonderful readers to thank. Hoping all of you will pick up a copy of my book and give me a try if you haven't already. I have never been on a real cruise but would love to! I have been on short ones take three hours or so. One was on the river thar Mark Twain wrote about, I saw the island that where Huck Finn went. We were on a paddlewheel boat and it was a great experience to watch the watch splash over the wheels. Another was of Lake Michigan. It feels like you are on the ocean. What I enjoyed the most was eavesdropping on two Dutch men telling what they would do to the lake if they could. Applying Dutch knowledge to make more land! I also went on a two short cruise of the water that flows through the Mammoth Caves,one on top ot the river. The other one was inside the caves. I was young at the time and was trying to get into the boat and slipped. A handsome ranger caught me and gently set me down into the boat. I kept thinking of him for the remainder of the trip! I took a three week tour of China and had a cruise of the Suzhou river. Suzhou is the Asian Venice of the World so we watched all the building on the sides and people living on boats. They waved to us. Some were washing their dishes in the river, other washing clothes with river water, some bathing. What I remember most of that trip was the people's smiles. Also when I was young, we rode the Long Island ferry and saw the Statue of Liberty, tears in my eyes, United Nations building, boys diving from some cliffs. So even if you can afford an overnight cruise, don't give up. You can still go on three hour ones. I have enjoyed all sorts of music on the boats, have eaten at the buffets (usually not the highlight because food is limited in vareity)enjoyed the sights and most of all the people. Judy, I have so much fun coming up with titles. The next two books in this series are Chicken Cacchia-Killer and Enchi-Lada Bodies. Have a great Christmas and thanks for commenting. Wow! I've often wondered if those under 24 hour cruises were worth it, and you've answered my question. There's something about being with a group of strangers having fun and enjoying the sights and the sounds that really intrigues me. Thanks so much for sharing that with us, Carol. Sorry you didn't post in time to win the book. But check out my FB page the first of the year as I will be on several blogs with giveaways, including my own, Mysteries and Margaritas. I think of you every time I see a penguin! !